My 8-year old nephew Matt was visiting yesterday afternoon. He’s an amazing kid-foodie, meaning that he likes to eat good food, well, he actually demands to eat good food. I can’t think of something he doesn’t eat. He tries even the most bizarre foods you put in front of him— jelly fish, liver, stinky cheeses, etc. He tastes everything, and never says no or make a disgusted face. If he doesn’t like something, he just says it's not for him, which I think it's awesome. Yesterday, out of nowhere, he asked if I could make spinach and cheese ravioli for dinner. No, not the frozen or canned ravioli, he wanted me to make fresh ravioli from scratch (which is something we had already done together before). 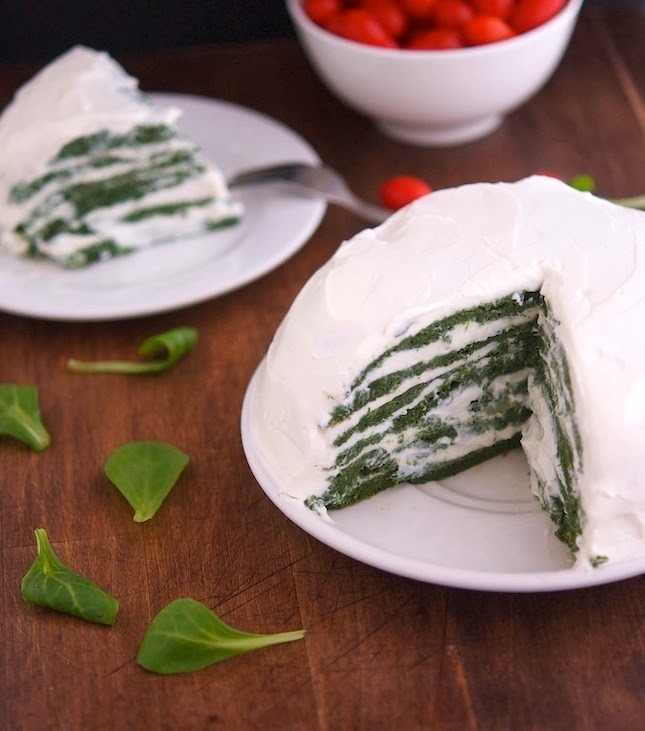 So we literally invented this spinach omelette layered cake. True story. This cake is really easy (and fun) to whip up. You basically make some small spinach omelettes, a batch of whipped ricotta cream and then you assemble the cake. The coolest part is that it looks exactly like a cake with vanilla buttercream frosting. You need to taste it to realize that it’s not a dessert. 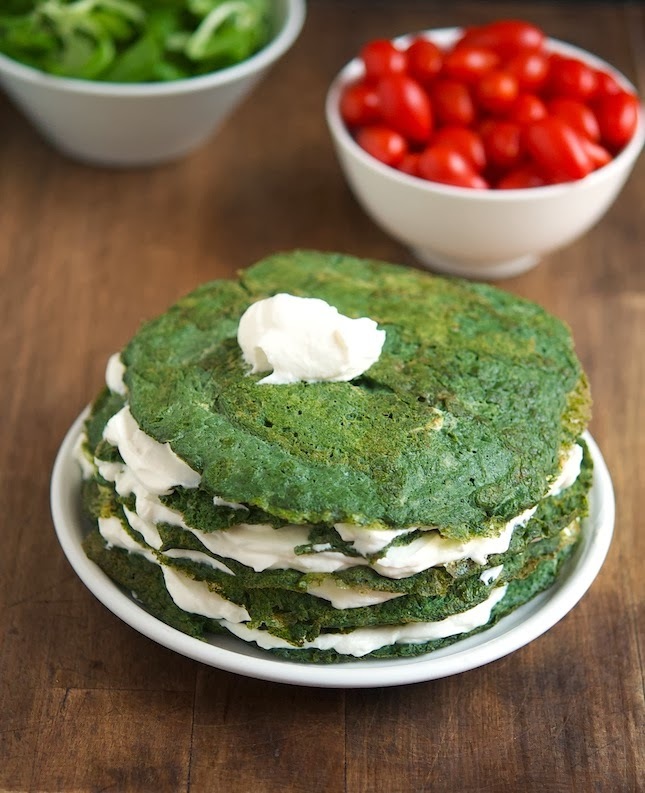 It’s gluten-free, grain-free, vegetarian, paleo-friendly, packed with greens and delicious. To be honest this is more of a spring/summerish dish than a fall one, just because it’s a cold dish. But ‘round here it still pretty damn warm so...why not? 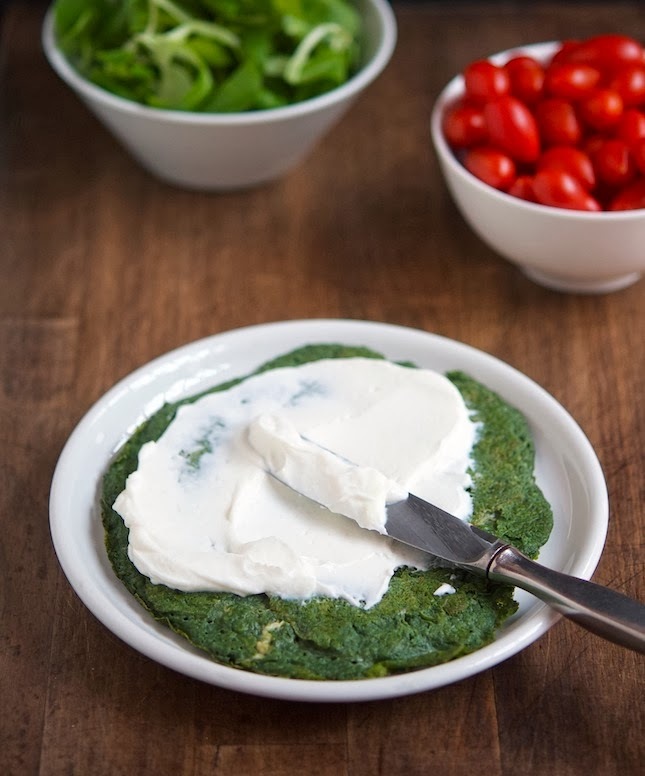 Spinach Omelette and Whipped Ricotta Cake Print this recipe! Stem and wash your spinach well but no need to spin or pat it dry. Set aside. Heat 1 tablespoon of olive oil in a large pot, add onion and saute’ for 3 to 4 minutes, until translucent. Add spinach, cover with a lid and cook, stirring occasionally, until wilted, about 2 to 4 minutes for baby spinach and 4 to 6 minutes for regular spinach. Transfer to a colander and drain. With the help of a spoon press the spinach to extract as much water as possible. Transfer spinach to the bowl of a food processor and puree until smooth (alternatively you can use a blender or an immersion blender). Set aside. In a large bowl combine eggs, water and salt and briskly whisk with a fork just until yolk and whites are thoroughly blended (do not overmix). 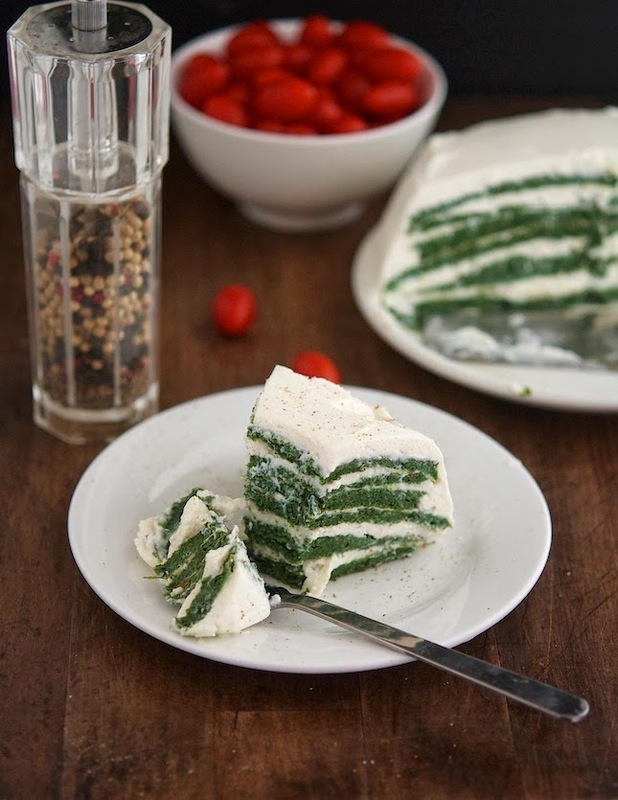 Whisk in spinach puree and ground black pepper. Place a small nonstick skillet (I used a 8-inch) over medium-high heat 30 seconds and lightly grease. Pour ⅓ cup of egg mixture and give it a good swirl so that they spread out thinly across the entire pan. Let eggs set, this happens quickly depending on the heat of your pan - about one minute. Run a spatula underneath the omelette, turn the omelette upside-down and cook on the other side for further 30 seconds. Slide the omelette out of the pan onto a countertop, large cutting board or large plate. Repeat with the remaining spinach egg mixture. I made 6 omelettes. Set aside and allow to cool. In the bowl of an electric stand mixer fitted with a whisk attachment, beat cream cheese until smooth and pliable. Stop the mixer and add ricotta, milk, salt and pepper. Beat on medium speed for 4 to 5 minutes or until mixture is less grainy and fluffed. Once the omelettes have cooled, place one omelette on a serving plate and spread over a layer of ricotta cream onto it. Gently press another omelette onto the ricotta cream, try to get it as flat as possible and make sure the cream is to the edge. Repeat for as many omelettes you have. When done with the layering “frost” the top and sides with the remaining ricotta cream. Place in the refrigerator and allow to set for at least 30 minutes before serving. One serving yields 237.5 calories, 17.5 grams of fat, 6.8 grams of carbs and 13.9 grams of protein. Your nephew really seems to be an awesome little guy! this is an amazing recipe. I am always looking for low carb recipes to get my dessert fix. 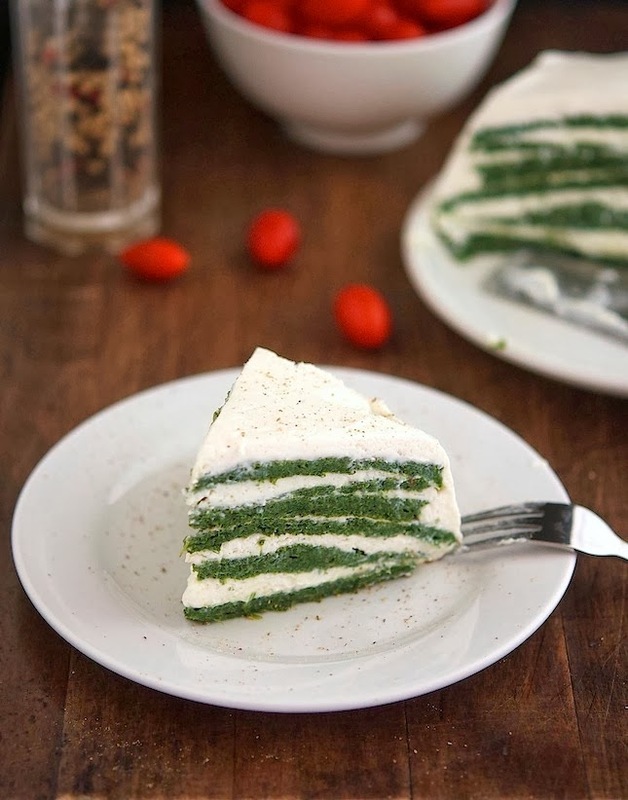 this is like a creamy veggie dessert! Thank you both Daniela and Dina, this "cake" is really good! OK, that is an absolute original and looks delish. I have to make this one soon. This would be a stunner on a brunch buffet table. Your nephew sounds like a great kid, a nice way to bond with him. What????? This is awesome. Totally out of the ordinary but I think this is completely unique and I bet that whipped ricotta is magic.